Care homes happen to come onto my turf because of my interest in the English dementia strategy. Eighty per cent of people living in care homes – more than ever thought before – have either dementia or severe memory problems according to a Alzheimer’s Society report published in April 2013. It was also reported that less than half of these, 322,000 people are enjoying a good quality of life. I found yesterday’s conference on enhancing health in care homes a real ‘breath of fresh air’. The audience didn’t consist of ‘clones’ who were “on message”, but consisted of a large range of people from different backgrounds. I know because Prof David Oliver, the Chair for the morning, asked what these backgrounds were – ranging from care home managers to University academics. ‘Co-production’ came across very strongly as an emergent theme in a number of presentations. And rightly so. Innovation, whilst cracking a few eggs to make omelette, is also about avoiding those turkeys which don’t fly. I, in fact, asked a question off NHS England on how we’re to know whether the ‘Care Home Vanguards’ will be just like the million ‘pilots’ which have preceded them. And yes – many of us don’t like the military terminology. We do need to talk about care homes. Somebody pointed out that the people who ‘own’ care homes are the residents, and this is indeed reflected in the wish that all people do when they move into a care home ‘is change address’. The concern that residents in care homes are quite divorced from friends and family is a very real one, I feel. I often get asked simply why care homes don’t have WiFi – this aversion to WiFi seems to be shared elsewhere in the NHS, such as in GP practices. Prof David Alldred presented an overview of the strand of policy focusing on the use of medications in care homes, ranging from the well known CHUMS study bang up to date with the recent NICE guidelines. Prof Adam Gordon presented a coherent range of peer-reviewed evidence including his work and that of his principal collaborators on service provision in care homes. Both presentations, I felt, had as a common theme how we negotiate risk in policy, and certainly how we ultimately turn the health and social care service from being reactive to illness to being proactive to health. In the same way we wish to celebrate good care as well as identify bad care, we can’t ignore the things we keep on ignoring. 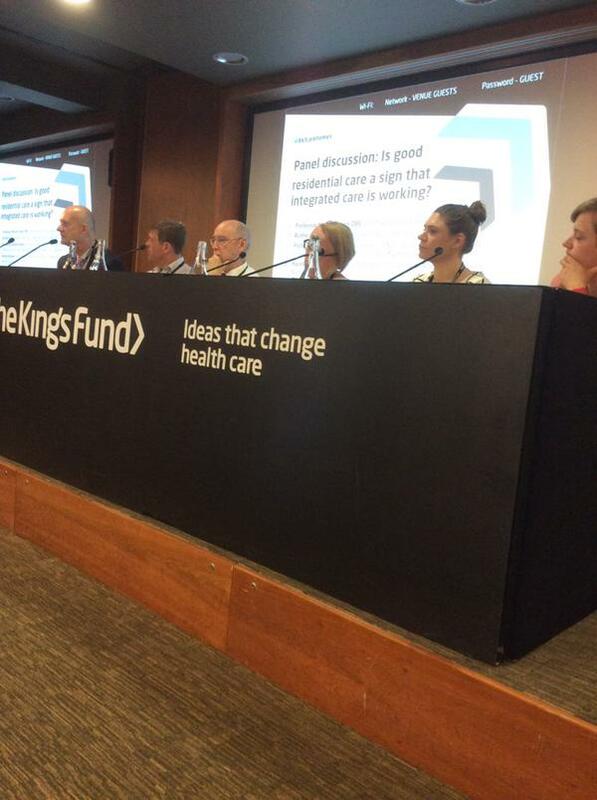 A strong message from the #kfcarehomes day was the need for a holistic view to attending to a person’s needs. This not only includes mental health needs, but physical health. Often medics are very good at ignoring oral health, eye care and foot care; and yet this came across loud and clear as important issues. The day did not shy away from THE main issue – decades of chronic underinvestment in social care services. Prof Julienne Meyer was robust in her opinions, which were hugely popular with the audience. It seems further that many agreed that care homes have been reputationally neglected (and that any focus in the media on care homes has generally been a negative one). This is clearly having repercussions in attracting, say, the best nursing staff to work in care homes, and maybe the professional College may need to think of fast-tracking a specialty competence qualification for care homes. It would be wonderful if there were some continuity with clinical specialist nurses in the community, hospices and hospitals. It’s critically important that all staff are not paid ‘bargain basement’ rates for the sake of the “bottom line” – there were several calls for the implementation of a living wage (and the national minimum wage). In the same way that care homes cannot be considered islands in policy, surrounded by unbridgeable water, it’s hard to make a clean break for care homes from the rest of policy. Aside from the ongoing discussions about pooling budgets, and so forth, a recurrent theme was that residents in care homes are entitled to the same health care as would be expected from the best of the NHS. In fact, as Alldred and Gordon were doing their presentations, the thought crossed my mind why their work was not more openly aligned with the NHS Outcomes Framework. There is currently a pause in the legislation, as we wait with baited breath for the Part 2 of the Care Act to be implemented, and there’s a further new carers’ strategy from Alistair Burt, the current Government Care Minister. Part 1 of the Care Act is highly significant in its statutory duty of the promotion of wellbeing, and this is a must obviously in care homes too. When I think ‘back to basics’ of the work of the late great Prof Tom Kitwood, it must be the case that, where possible, residents of care homes must be in touch with factors which reinforce personhood, like their past, and current relationships including friends and families. Also, I think care homes are a great place for reablement and rehabilitation for people with dementia, in a social model of disability. It’s incredibly easy to chant ‘no decision about us without us’, ‘person centred integrated care’ or ‘let’s break down the silos’ like weird followers of a strange sect. But I did find a paucity of evidence presented yesterday on how ‘users’ of the new services were finding their experiences, apart from a few anecdotes which could easily have come from a marketing pitch. One was left wondering first of all how one would break down the silos – and I think Dr Phil Earnshaw, lead for the Wakefield NHS CCG, did well to convey how an ideal would literally be people talking freely to one another. And we do need to pool learnt skills, behaviours, and knowledge – the very best of knowledge end of life research in hospitals and hospices should be made available to those looking after patients in care homes. I think some of this is down to how well leaders in different fields are able to respond to feedback. Shared, distributed, leadership, or whole systems regulation, all makes intuitive sense. Of course it does. That is, until you think about who ultimately takes responsibility for key decisions concerning a patient (e.g. “the medication review”). I asked who is best placed to erase from a drug chart an inappropriate prescription of an antipsychotic, to replace it with a ‘social prescription’ such as an iPod. Talk about ‘collaborative working’ ‘sharing risk’ and ‘not looking for blame’ trips off the tongue for advocates of alliance contracting, say, but the reality of what is happening ‘on the ground’ is worth thinking about in the English dementia policy.